Starbucks dropped to its lowest consumer perception level since November 2015 in the wake of a racially-charged incident in Philadelphia last week that went viral, according to YouGov BrandIndex. In November 2015, Starbucks received backlash when it replaced its annual “symbols of the season” Christmas cup design with a simple two-tone red cup. The current drop is about at the same rate as the one in November 2015. With the brand generating more news on Tuesday – a second video went viral of a black man being denied bathroom access in California, and Starbucks announced its stores will be closed on May 29th for “racial bias education” – more perception movement is likely to occur. To put what has happened this far in perspective, let’s look at how we measured perception using our Buzz score, which asks respondents: "If you've heard anything about the brand in the last two weeks, through advertising, news or word of mouth, was it positive or negative?" A score can range from -100 to 100 with a zero score equaling a neutral position. For example: a score of 35 means that 35% more people said they were positive than negative about the brand. Since last Friday, Starbucks’ Buzz score fell from 13 to -8 on Tuesday, a drop of 21 points in four days. 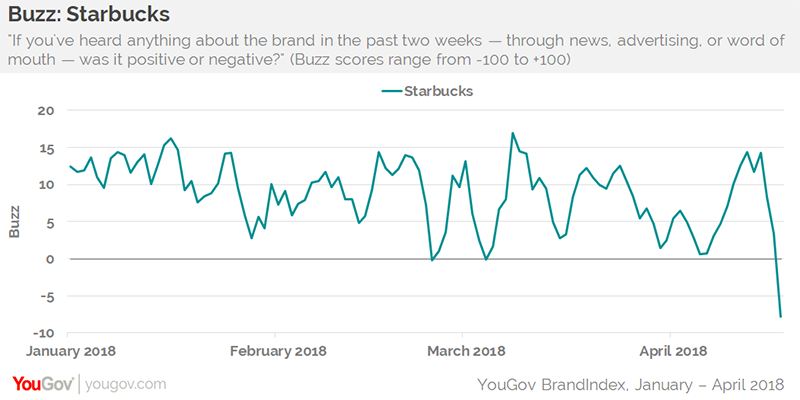 When the 2015 Christmas cup incident occurred, Starbucks fell from a Buzz score of 11 to -9 in four days too, eventually hitting a bottom of -13 the next day. Purchase Consideration: On Friday, 28% of consumers would consider making a purchase at Starbucks the next time they went to buy food or drink. On Tuesday, that number was 25%. Reputation ("Would you be proud or embarrassed to work for this brand? "): Using the same -100 to 100 scale as Buzz, Starbucks dropped from 14 on Friday to 4 on Tuesday.